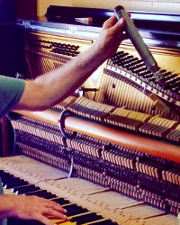 At Martin’s Piano Tuning & Repairs we can & regularly do most every major & minor repair to all different makes of pianos. From the basics of regulating a piano so it’s in good playing order, major action repairs to restringing. When it comes to an old piano, I believe that none are beyond redemption. But it does depend on your finances & also how much you love the piano. 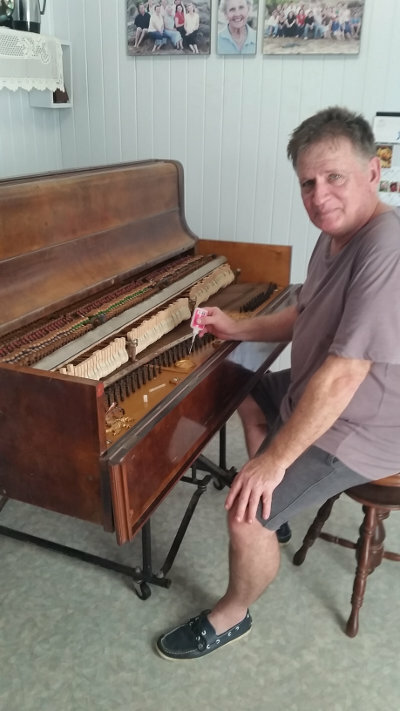 The piano tuner cannot tell you over the phone if your piano is worth repairing or not. The piano tuner must first visit your house & look at your piano. Secondly he must remove the top door, the key cover & the bottom door & with torch in hand, look for key factors which will alert him to certain issues. He must also have his tuning wrench in hand to check torque tension on the tuning pins to ascertain whether or not they will need some work & know if the strings are in fine enough condition to stand a good solid tuning or whether they need replacing. If your piano is a family heirloom then you will probably be more inclined to want to do major repairs. Do not take anyone’s word that your piano isn’t worth repairing unless they are willing to go the extra mile, turn up at your house & tell you why your piano is not worth repairing. THEN, ask for the reasons in writing. Don’t fall for needing a new piano until you’ve had a 2nd opinion & all feels right to go whichever way you decide. Sometimes, the best thing that you can do for an old piano is to just replace the hammer heads. Depending on what you require from the instrument & how much you can spend will determine what we can do. I do have a payment plan in place for piano restorations worth more than two thousand dollars. It wasn’t that long ago that a piano with an old and weathered pin block and loose tuning pins was considered to be near the end of its life. This picture is of an old upright piano on its back having reasonably inexpensive work completed on its Wrest plank (pin block). With the application of a bottle or two of a thin C.A. glue between the tuning pins and the block, a piano that wouldn’t stay in tune is transformed and given a new life!